Arrival and departure records of travellers to and from Australia are held by the Department of Home Affairs (DHA). Older records are held by National Archives Australia (NAA). 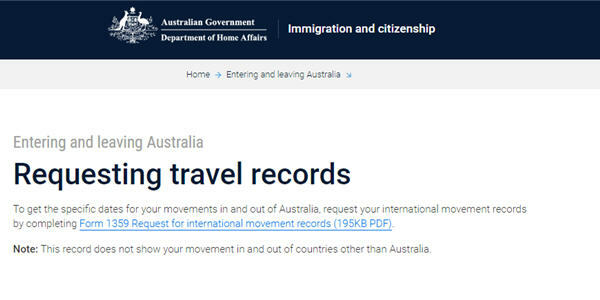 You can request a copy of your travel records, there is no fee to do so. travelled as a child on your parent’s passport include their name, date of birth and passport number (if known) on the form as well. were not required to use a passport when you first entered Australia there should still be a record of your arrival as passenger arrival cards have always been required. Use the Passenger records inquiry form to obtain your travel details from National Archives Australia. The information is held on microfiche, if you can provide the date or month and year of travel it will speed up the process. A request can take up to 30 days to be processed. Send the completed International Movement Records form to your nearest Department of Home Affairs office, along with a certified copy of your photo ID such as your passport or driver’s license. Your records should arrive within 1-3 weeks. If your travel records are missing a critical travel date submit a Request for Informaton (Form 424A) to the Department of Home Affairs. Under question 13 tick “Other”, and state the information is required urgently for a visa application. There is no cost to request your own records.